The easiest way to do this would be to compile a list of lightweight running shoes with their weight sorted in ascending order. But that would be a completely pointless exercise, for that list would be full of impractical racing flats and little else. A better way is to group the shoes by use-cases – in the same way some of our other guides are structured. If this guide was written ten years ago, most lightweight shoes would feature injection-molded EVA midsoles with a token outsole placement. Back then, running shoes had to follow a strict weight budget – cuts made in one place had to be made up somewhere else. Design and material cutbacks usually meant a compromise in performance or durability. Not any more. In 2019, lightweight running shoes match and sometimes exceed the median lifespan. While the midsole foam materials have improved a lot, lightweight shoes also happen because of the upper and outsole. Single-piece knit or engineered mesh uppers help cut down on weight, as do thinner outsoles. Thick outsoles made of superior rubber (eg. Continental) are still the most durable kind. At the same time, brands use a combination of improved compounds and clever engineering to reduce weight without a durability trade-off. For example, the Pegasus Turbo uses perforated thin lugs which flex together with the soft midsole. The New Balance Beacon plugs small rubber lugs to what is otherwise an all-foam outsole. Not too long ago, 12 – 13 ounces was the acceptable weight range (refer to our 2011-2012 reviews) for a running shoe. Today, solereview will instantly dock a few points if a shoe weighs a sliver over 11 ounces. In most cases, a lighter running shoe is always better. You’re carrying less weight for every mile of your run, thus making the shoe less of a distraction. 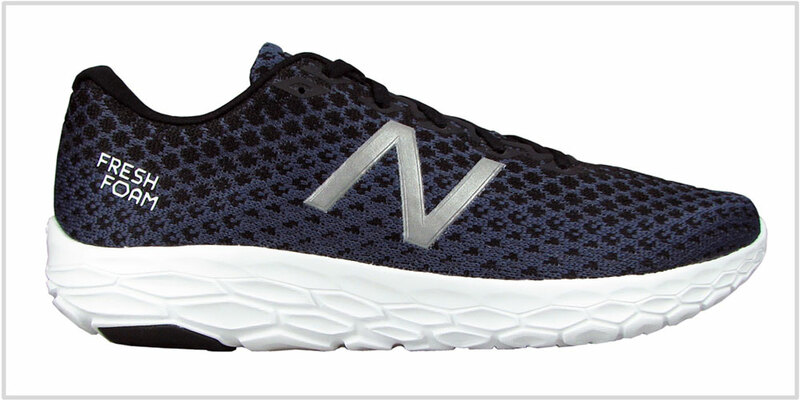 Runners love the NB Beacon or Nike Epic React not just because they’re cushioned and versatile but also how light they are. Trail running shoes are an exception – removing things like the rock plate, a rugged outsole, and protective upper overlays will affect versatility. 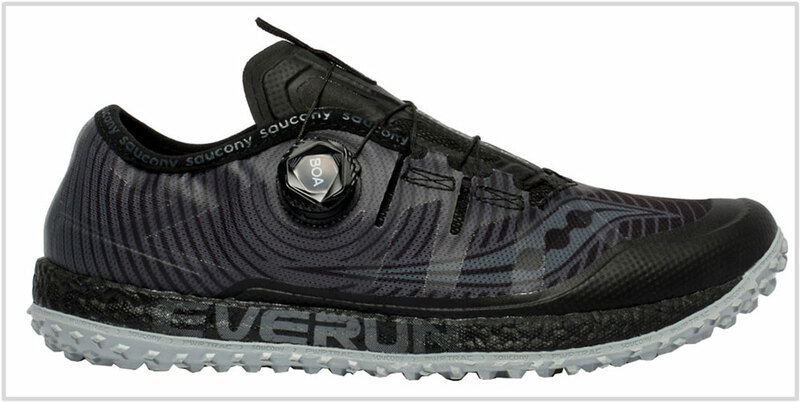 For example, the Saucony Switchback ISO is a great shoe but is limited to milder outdoor terrain. Also, certain stability shoes can’t do without a support device (eg. the Brooks Beast or NB 1260V7). In such cases, a lighter build will water down the value proposition. The bar for the ‘lightest’ tag isn’t the same for every category. It would be unfair to expect a cushioned, high-mileage oriented shoe to weigh the same as a racing flat. This guide is sectioned into three categories. 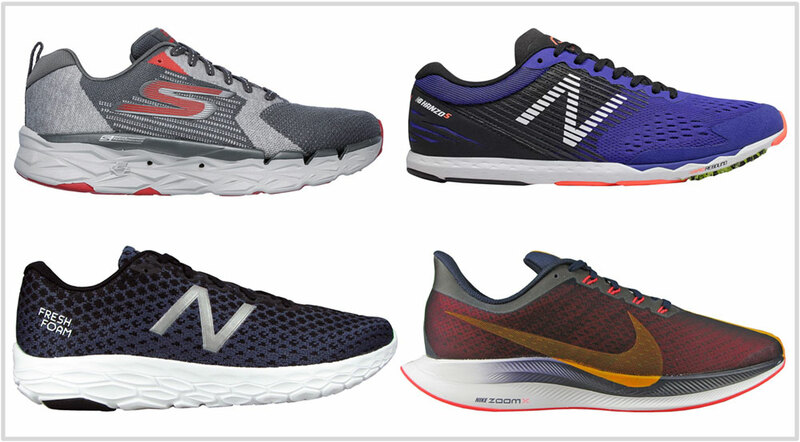 The first category groups cushioned running shoes suitable for daily runs to a marathon. All these shoes have a high-volume midsole for long-distance comfort. Of late, there have been so many Fresh Foam intros. It was hard to imagine that a new model would offer something different. But here we are – the Beacon made its debut last year to unanimous praise. While there is no such thing as perfection, the Fresh Foam Beacon differentiates itself by being an extremely lightweight and cushioned shoe. It takes a few good things from the Zante and borrows character traits from the Boracay. The end product is a running shoe which is useful for most runs – all at a very low weight footprint. The Vaporfly is a special shoe. It’s amazing how much this shoe packs for its sub 7-ounce weight. The dual-density midsole is full of responsive cushioning. There’s even a proper outsole protecting the midsole. And somewhere within all that is a full-length plate which gives the VF 4% its signature snap. Cushioned road-racers are nothing new for Nike. In its heyday, the Lunaracer 3 was the running shoe of choice to run races in cushioned comfort. The Vaporfly takes it to the next level. Both the heel and forefoot damp incredibly well – the heel is soft but weight loading is also assisted by the embedded plate. The forefoot is ultra-stiff with zero flexibility. When you pair the latter with the spring-assisted rearfoot, the transition becomes all about quick roll-offs. The heel isn’t very stable and the foot tends to load on the narrow midsole waist, so the VF 4% is best used for speed runs. Can the Vaporfly be used as a daily trainer at slower paces? The whole roll-off process feels more efficient when going fast. So if you want something more versatile, then consider other shoes on this guide. The Flyknit version of the Vaporfly is still widely available in major markets – so grab them before they’re gone. Two things make the Nike Epic React Flyknit V2 cushioned and lightweight. One, the midsole is made of a synthetic rubber blend which possesses a densely-cushioned character. Nike calls this the ‘React’ foam – a material which adds lots of softness minus the excess weight. Two, the upper design is very simple – a single piece of knit mesh stretches snugly over the foot without adding bulk. The soft ride isn’t mushy at all, so do what you please with the Epic React – be it routine training, distance trips, or scenery-admiring runs. Love it or hate it, one can’t ignore the fact that the Pegasus Turbo offers one of the best cushioning-to-weight ratios in the business. The dual-density midsole has superlative cushioning which is capable of many things, be it daily workouts or a marathon. The low roof of the upper squashes the toes and hems in the forefoot – that, and the price could be a deal-breaker for some runners. The GR 3 Ultra is an 8-ounce max cushioning shoe – use it as your daily ride or for running marathons. In addition to a very comfortable ride, the MaxRoad 3 has a generously ventilated interior. The roomy knit upper is fairly breathable; underneath, the vented insole and the midsole assist air circulation. 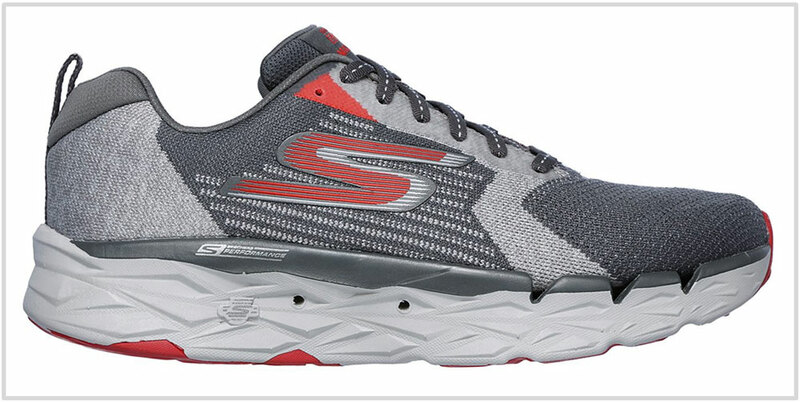 Skechers will eventually update the MaxRoad 3 Ultra, so it would be wise to stock up. Unlike the Razor 3 featured next, the New Balance Hanzo S V2 is the epitome of the traditional racing flat design. This 6-ounce racer is all business, be it the low-profile midsole with a 4mm drop or its aggressive forefoot lugs which provide maximum road grip. It’s plain to see that this shoe was built for speed-work. The pancake-thin midsole provides just enough protection and little else. The snug-fitting upper uses soft materials for a pliable feel, and it looks good too. The high-density screen printing on the midfoot acts both as support as well as a visual detail. If hard-on-your-feet racing flats aren’t your preferred choice of footwear, buy the Skechers GoRun Razor 3 Hyper. The latter isn’t a racing flat – it’s more like a speed-friendly shoe with lots of cushioning. The new Hyper Burst foam midsole provides an optimal mix of cushioning and responsiveness – all within a 6.4-ounce silhouette. If you’re planning to run longer while maintaining threshold speeds, then the softer Razor 3 will do very well. The upper fits narrow and somewhat shallow. The New Balance Summit Unknown replaces the Vazee Summit – this means that the Unknown is a lightweight trail shoe meant for speed-work. This shoe weighs less than 9 ounces but offers all the essentials. The forefoot has a protective rock-plate, the upper has a synthetic toe-bumper, and the aggressively treaded rubber outsole does what it’s supposed to. The midsole is constructed using dependable Revlite foam which balances cushioning with ground feel. If your trails runs do not call for a forefoot rock plate, then the sub 10-ounce Saucony Switchback ISO should be on your radar. This is the only Saucony model where the ISOFIT complements the upper fit instead of being gratuitous. It meshes perfectly with the BOA dial-fit system for a great fit. There’s plenty of midsole cushioning- hello there, Everun – with the Saucony PwrTrac providing traction and terrain protection.